EVERSPACE, the rogue-like space shooter game developed by German studio ROCKFISH Games, was originally Kickstarted in August 2015 as a PC title with console ports on PlayStation 4 and Xbox One as stretch goals. 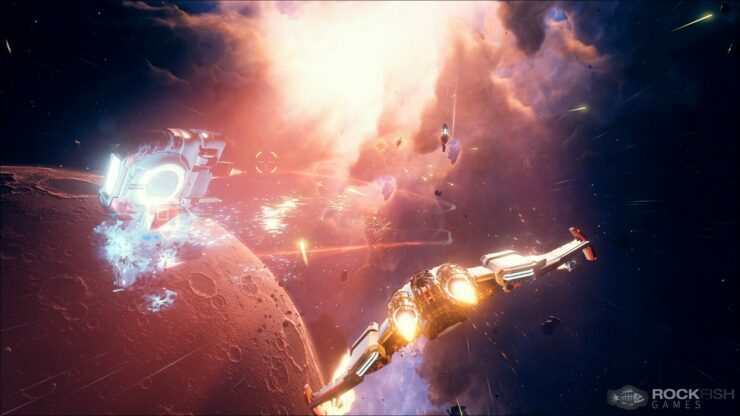 A few months later, it was announced that EVERSPACE would be a timed console exclusive for Xbox One, leaving PlayStation 4 users out for the time being. That’s all about to change shortly, with EVERSPACE set to launch in late May on Sony’s console after debuting last year on both PC and Xbox One. We reached out to ROCKFISH Games to get more information on this upcoming launch as well as their other plans. Let’s started with the technical specs of EVERSPACE running on Xbox One X, with the enhanced patch coming soon, and PlayStation 4 Pro as they were shared by CEO and Co-Founder Michael Schade. EVERSPACE is listed among the officially confirmed Xbox One X enhanced games. Can you tell us the enhancements you are planning for this version? What do you think of the console as a whole? There is no denying, for a console, the Xbox One X is a beast, and we are glad that it closes the gap to mid-class gaming PCs. Of course, you will always have more computing and rendering power in a high-end gaming PC, but it will come at a much higher cost, in a much bigger casing, and with more maintenance effort. On console, Everspace has never looked better and played more smoothly than on the Xbox One X, hands down. However, it took us a while to make the most out of its power when running Everspace on Xbox One X in 4K but also in 1080p because we had to migrate the whole project to a higher version of Unreal Engine, twice. Finally, the build for Xbox One X was approved by our friends at Microsoft just a few days ago, and we are excited to share that Everspace runs on Xbox One X in native 4K with 30 fps looking super crisp. On a full HD screen, it runs with 60 fps in native 1080p (instead of 83% screen resolution on Xbox One (S) with an improved level of detail distance settings as well as better shadow, shader, lighting, and VFX quality. Now, before we can release the enhanced version, we have to bring the UWP version of the game to Unreal Engine 4.17, too. This is due to the fact Everspace supports XPA requiring cross-platform compatibility for save games. From our experience with porting to UWP so far, it is hard to predict how long this will take, but we are hoping it will be just a matter of a few weeks. Or, in the best case scenario, just a couple of days. Will EVERSPACE launch on PlayStation 4 and if so, are you also preparing PSVR support? Porting Everspace to PS4 and PS4 Pro has already been completed and we have just announced partnering with our Spanish friends from Badland to also have a boxed “Galactic Edition” coming out on May 29. Granted, the PS4 Pro does not provide the same oomph as the Xbox One X does, but even in checkerboard 4K, the game looks significantly better. The same goes for running Everspace on the PS4 Pro in 1080p because we made similar visual improvements as we did on Xbox One X. However, on PS4 Pro, we had to slightly downsample the 3D scene to maintain 60 fps most of the time. We won’t be offering PSVR support, though. It took us a lot of time to get VR support ready on PC, and we still run into new issues when migrating to a newer version of Unreal Engine. Also, there seem to be more titles that are VR exclusive for good reason, like performance optimization and gameplay that works well in VR. While VR players on PC immensely enjoy traversing our beautiful Everspace universe, the game is probably a little too fast-paced for the optimal VR experience which is even truer when running on current gen console hardware. Check back tomorrow for our full interview with Michael Schade on EVERSPACE.